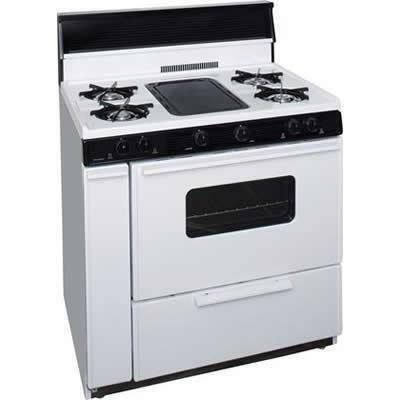 Premier 36 inches cordless gas range with 10 inches glass backguard. Battery Powered Ignition which means no A/C Power is required to operate this range. Stainless steel griddle cover. Additional Information High grade, durable porcelain finish on both the cooktop and 4 in. backguard; Up-front controls eliminate the need to reach over hot burners, making this range ADA compliant; Baffled oven burners distribute heat evenly throughout the oven; Two heavy-duty oven racks with stop position.